Dante Malagrino (far right) at Structure 2011. Embrane, the not-so-stealthy startup that’s one of several hoping to make it big on the concept of virtualizing the network, launched on Sunday. The company, founded in 2010 by Dante Malagrinò, has raised $27 million from Lightspeed Venture Partners, NEA and North Bridge Venture Partners with the goal of providing software that will deliver services over software defined networks. The idea of software defined networks is finally coming into its own. Startups including Big Switch, Nicira, ConteXtream and large companies such as VMware, (s vmw) Cisco (s csco) and Juniper (s jnpr) all espouse the need to change the network to make it more flexible to gain the efficiencies the computing side of the business has already gained with virtualization. The goal is to abstract the physical elements of the network so it can keep pace with the virtual machines that spin up and down inside a virtualized environment. One way of doing this is via the Open Flow protocol, but other companies such as Cisco, Juniper and HP (s HPQ) are also trying out different ways of creating such a virtualized network. The goal of any software defined network is to help companies scale their networks in line with their compute resources and reduce the need for a network engineer to manually reconfigure boxes to handle fluctuating server workloads. For more on the topic, please read our research report on software defined networks and Open Flow. (sub req’d). In line with this new network vision, Embrane wants to provide services such as firewalls, load balancers and whatever else might be required over a software defined network. So while it can work on networks using Open Flow, it can also work on other virtualized networks. Denis Martin, the chief technology officer at hosting company, NaviSite, said his company is replacing Cisco and Citrix (s CTSX) load balancers and firewalls with Embrane’s software in its cloud product because Embrane’s software can scale along with the new virtual machines NaviSite’s clients spin up and down on demand. Embrane’s heleos software is aimed at cloud service providers, and as Martin pointed out, it scales, unlike some of the dedicated hardware or even appliances currently available for network services. However, even with $27 million and big-name backers, Embrane is going up against some tough competition in Cisco, Citrix and other networking vendors. Its expected client base is used to buying from large vendors and might not rush to take a chance on a startup, even a startup with an executive team that comes from the established networking companies. 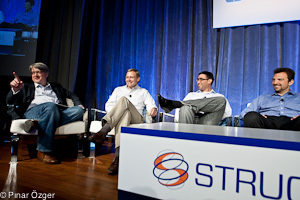 Embraneâ€™s virtual network appliances for an SDN world: Dante Malagrino (far right) at Structure 2011.